Shrunken slate or fat phone? Review The buzz surrounding Apple’s iPad has prompted a rush of me-too tablets hoping to combine its up-to-the-minute spec, with practicality and usability. Unlike the iPad, Samsung’s much-anticipated Galaxy Tab also has the advantage of being a phone, and a 3G Android smartphone at that, with huge potential for add-on functionality. It’s also got 802.11n Wi-Fi, GPS, Bluetooth 3.0 and a 3.2Mp camera. The outcome of the tablet wars may ultimately be decided by the optimal size of the screen – just how small or large can it be before it becomes impractical in either direction? The Galaxy Tab is too big for a pocket, but it’s lighter and smaller than the iPad at 191 x 121 x 12mm and 384g compared to 243 x 190 x 13mm and 730g for Apple’s fondle slab. At 1024 x 600 pixels, the sharp, bright 7in multi-touch capacitive screen is certainly large enough for viewing films and also, crucially, for reading e-books. It may only be 2in bigger than Dell’s interesting Streak hybrid, but that makes quite a difference in elevating it from ‘big phone’ to ‘enhanced tablet’ status. Yet the Tab's display revealed fingerprints rapidly become quite a serious problem, and I soon found myself pining for the iPad’s grease-resistant coating. 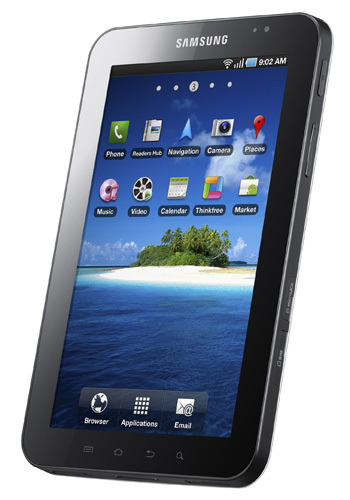 Powered by a 1GHz processor, the Galaxy Tab is generally pretty nippy, although running several apps at once can occasionally cause it to stall. It also tends to get a little warm with extended use. Having a plastic back seems to contribute to this, given that the iPad stays cool in its metal casing. 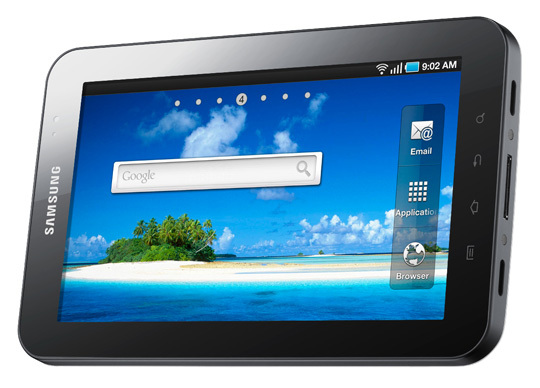 The tablet runs Android 2.2, also known as Froyo, the latest incarnation of Google’s Open Source mobile OS. Indeed, you’re frequently reminded that this tablet is running handset software with numerous phone references in various prompts. None too surprising perhaps, given the distinct advantage the Galaxy Tab has over the iPad is that it can function as a standard mobile phone. Yet pressing its brick-sized bulk to your ear looks a bit Dom Joly ‘I’m on the phone!’. Calls through the onboard speaker don't sound too great either, but adequate, if you're pushed. There are multiple home screens which can be populated with all manner of shortcuts and widgets, although only a few appear on Samsung’s own Apps store. Usefully, there’s an active applications widget called the Program Monitor that you can attach to the home page. This app tells you exactly what you’re using so you can quickly quit unused apps to save on battery. There’s also a basic file browsing app but, frustratingly, it won’t let you rename files.